At a time when the ad industry is embracing ever shorter forms of advertising for both TV and digital media, consumers say they actually prefer longer-form ad messages. 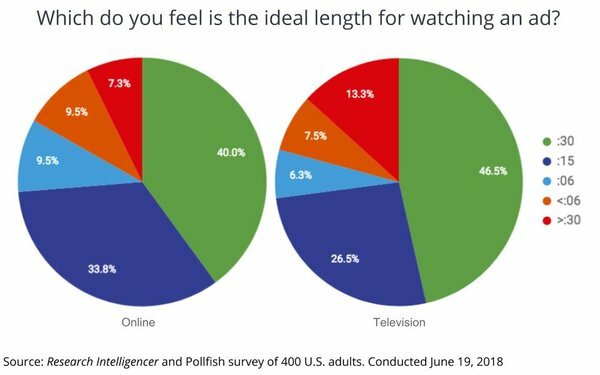 A survey of U.S. adults conducted this week by Research Intelligencer and Pollfish finds most believe TV’s standard-length commercials -- :30s and :15s -- are the ideal length, not the six-second and shorter units being tested and researched by the advertising and media industry. For television, 46.5% of respondents cited 30-second and 26.5% cited 15-second commercials as the optimum length to engage with advertising. Interestingly, for online media -- where shorter-length units such as six-second pre-rolls have long been a standard -- nearly the same percentages of consumers said they prefer :30s and :15s. The findings are self-reported, and run contrary to research conducted by media suppliers such as Fox that have been testing short-form TV ad units, as well as recent scientific studies by the Advertising Research Foundation and Nielsen, using biometric and neuromarketing techniques, respectively. That said, some industry observers have noted that even the scientific testing has been done in environments where short-form TV ad units are few and far between, and that their effectiveness and ROI may be distorted by their novelty. The ARF study in particular, was criticized because the study measured short-form ads put in so-called “premium” positions during commercial breaks, which likely would have biased the results. Asked which media experience would be best for them, “free access with a few long ads” as their No. 1 choice (38.9% responding), followed by “free access with a lot of short ads” (31.5%), “a higher fee with no ads” (13.3%), a “small fee with one sponsor’s ad” (8.8%), and “small fee with a few ads” (7.8%).